This APO refractor is a uncompromising telescope for astrophotography, due to the color-free lens and the 3.7" RPA focuser. With the Photoline APO series, Teleskop-Service stands for non-compromised optical and mechanical quality. 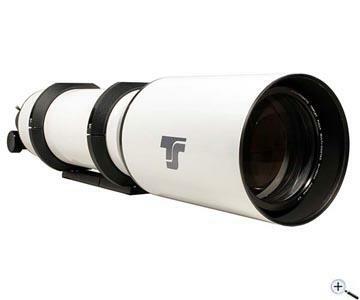 The 130 mm f/7 triplet Apo refractor is equipped with one of the best lenses in its class, including a proven Ohara FPL53 element. The temperature compensated cell keeps the lenses free of stress even in temperatures below 0 °C. The powerful lens is popular especially among astrophotographers, so we decided to offer this Apo with the big 3.7" RPA focuser. Now, CCD cameras with large sensors can be used and combined with all common correctors, like the Riccardi 0.75x reducer or the TS PHOTOLINE 3" flattener. We decided deliberately for the high-quality version with FPL-53 element to ensure the best possible optical quality. The multi coated lenses are mounted in a temperature compensated cell, the edges of the air spaced elements are blackened. One highlight of this telescope is the modern "Rack-And-Pinion" focuser. The quality is close to the well-known Feather Touch focusers from Starlight. The largely dimensioned focuser allows using full-frame or even large format cameras without vignetting, of course with matching correctors. TSFLAT3 - Large format corrector which does not affect the focal length. Corrector fits directly to the M92x1 thread of the focuser. The recommended working distance is 103 mm. Included is an adaptor to M48/2" filter thread. From this thread, there are 55 mm to the optimal position of the camera sensor - ideal for DSLR cameras.